The Jerusalem Post reports that an earthquake was felt in Israel last Friday, Feb. 15. Read the full story here. The earth shook in many parts of Israel at 12:37 p.m. Friday. The quake was felt mainly in coastline cities, including Haifa, Tel Aviv and Nahariya. The quake, Israel Radio reported, was also felt in Syria and Lebanon. A faded echo of the quake that hit the coast was also felt at the editorial offices of The Jerusalem Post in Jerusalem. The European-Mediterranean Seismological Center said on its Web site that the quake Friday was 5.3 on the Richter scale and that its epicenter was in Lebanon. The region is long overdue for an earthquake of epic and potentially catastrophic proportions, scientists say. The Great Rift runs all the way from northern Syria through Lebanon, Israel, the Arabah, and into eastern Africa. 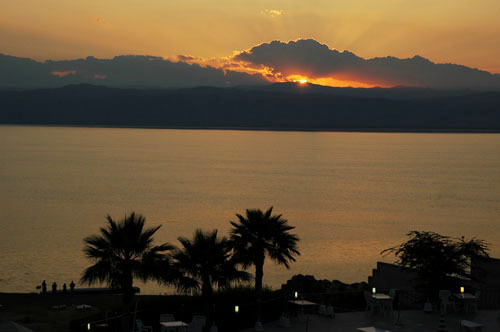 In Israel the area is called the Jordan Valley or the Dead Sea Rift, It is not surprising that earthquakes are mentioned frequently in the Bible. The prophet Amos dates his visions to “two years before the earthquake” (Amos 1:1). The earthquake he makes reference to must have been so memorable that everyone would know what he was talking about. Zechariah (14:5) also calls attention to this earthquake in the days of Uzziah king of Judah. Jesus, in predicting the fall of Jerusalem to the Romans, said, “and in various places there will be famines and earthquakes” (Matthew 24:7; see Luke 21:11). 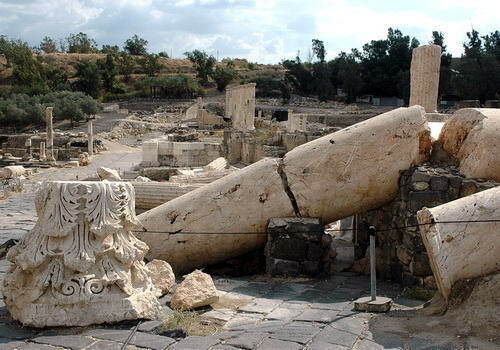 We have a wonderful example of the power of an earthquake in the Jordan Valley at the site of Bethshan [Bet-she’an, Beth-shean], about 25 miles south of the Sea of Galilee. The city was destroyed by an earthquake in A.D. 749. This photo shows the evidence brought to light during recently archaeological excavations in the city. The book of Enoch has received some attention in the news today. The Courier-Journal reports that a printed copy of Enoch was recently purchased by a collector, and is being placed on display at the Remnant Trust in Jeffersonville, Indiana. The article includes a nice video with good images of the book. Enoch was originally written in Hebrew or Aramaic by Jews, and some ancient fragments of it have been found near the Dead Sea. But the oldest complete versions are in the ancient Ethiopian language of Ge’ez because Ethiopian Christians are the only enduring church group that revered the book as Scripture. James C. VanderKam, a professor of Hebrew Scriptures at Notre Dame University and a leading expert on the Book of Enoch, has inspected the book on loan to the trust and estimates that it’s probably one of the five oldest manuscripts of the work. “We don’t have very many that go back that far,” said VanderKam, who is co-author of an English translation of Enoch and is working on a commentary. VanderKam estimated that the text was about 500 years old because its script and contents are similar to a manuscript of that age in the British Museum. Specialists in Ethiopian script could make a more specific determination, he said. By faith Enoch was taken up so that he would not see death; AND HE WAS NOT FOUND BECAUSE GOD TOOK HIM UP; for he obtained the witness that before his being taken up he was pleasing to God (Hebrews 11:5 NASB). It was also about these men that Enoch, in the seventh generation from Adam, prophesied, saying, “Behold, the Lord came with many thousands of His holy ones, to execute judgment upon all, and to convict all the ungodly of all their ungodly deeds which they have done in an ungodly way, and of all the harsh things which ungodly sinners have spoken against Him.” (Jude 1:14-15 NASB). The book of Enoch was not considered one of the canonical books of the Hebrew Bible (Old Testament) by the Jews, but Jude seems to think it expressed the truth about what will happen to false teachers. In the same way, Paul quoted pagan poets whose work expressed the truth he was seeking to express (Acts 17:28). 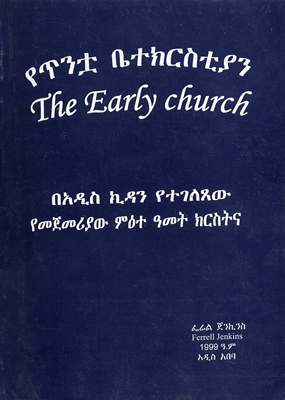 For several weeks I have been looking for an excuse to mention that my book, The Early Church, is now available in the Amharic language. All distribution is being done by Christians in Ethiopia, and I have no copies for distribution. 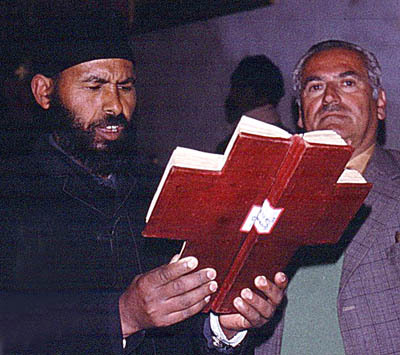 Ethiopians, sometimes called Abyssinians, have a small chapel adjoining the Church of the Holy Sepulcher in Jerusalem. 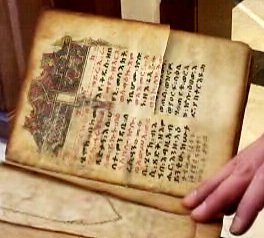 There they sometimes show a portion of the Gospels prepared in the shape of a cross. One of my guides used to ask the Ethiopian to read to us from Amharic. This photo was made in 1977. The only natural waterfall in Israel is located at Engedi on the west side of the Dead Sea. I spoke to one of the representatives of the publisher that I had come to know and told him this was a mistake that should be corrected. He thanked me and gave me a copy of the dictionary for having pointed out this error. I assume that future editions of the dictionary have a corrected caption. 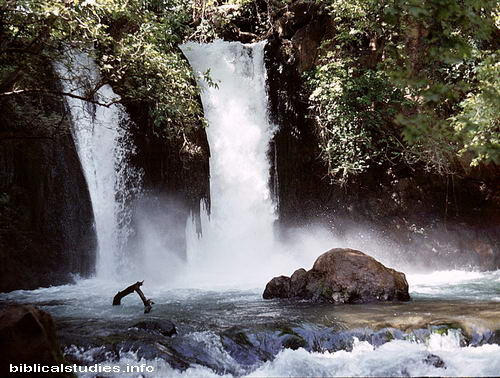 Here is a photo of the Jordan River Waterfall (sometimes called the Banias Falls) that I made in 1984. This waterfall is not far from the main road as you leave Banias (Caesarea Philippi) west toward Dan. A place like this would be most refreshing to a person like David as he was fleeing from Saul (1 Samuel 23:29-24:1). Of course, that was at Engedi, in the south. What really got me to thinking about this today is Todd Bolen’s BiblePlaces Newsletter which came today. In addition to links to news mentioned on the Bible Places Blog, the main feature includes the Waterfalls of Israel. There are five high-resolution photos and a PowerPoint presentation available for download. Todd also mentions other waterfalls in Israel. Several times before I have recommended the BiblePlaces Newsletter and the Pictorial Library of Bible Lands. Click here to subscribe to the Newsletter. Click here to go to BiblePlaces for information about the Pictorial Library. 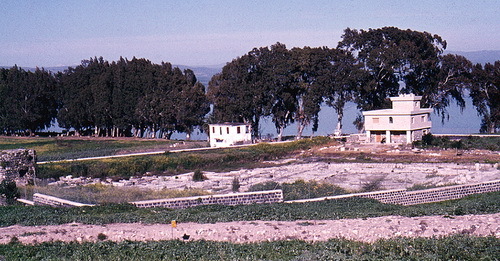 Archaeological excavations were conducted at Magdala in the early 1970s, on the plot owned by the Franciscan fathers, by Corbo and Loffreda. Biblical Archaeology Review announced (Sept/Oct 2007) that a new excavation will begin under the direction of Franciscan scholar Michele Piccirillo. In recent years entry to the site has been closed. The new excavations are welcomed. The photo below is one that I made in 1977 of the area overlooking the earlier excavations. A first century mosaic from Magdala showing a boat is on display at Capernaum. Moments after posting this blog I noticed that a report had been issued on new finds at Magdala. You may read the report and see new photos here. It will be exciting over the next few years to watch this ancient town give up its secrets. A new 2-shekel coin entered circulation recently in Israel. This might be of interest to people who plan to travel to Israel. The Israeli New Shekel is worth about 27 cents in US money, so the 2-shekel (NIS 2) will be roughly equivalent to our half-dollar. Most American tourists who are in travel groups have prepaid their arrangements and have little need to exchange funds. Dollars are widely accepted in Israel. The new coin has an interesting historical association on the reverse side. It is a design of a cornucopia, a horn of plenty, and a pomegranate. This design is from an historical coin minted in the days of John Hyrcanus. Hyrcanus was one of the Maccabeans who successed Judas. He became high priest, and then ruler of the Hasmonean Dynasty from 135-104 B.C. During his reign we have the first reference to the Jewish parties, Pharisees and Sadducees, that are prominent in New Testament times. John Hyrcanus extended the territory of the Maccabeans by seizing Idumaea (enter Herod!) and compelling the Idumaeans to be circumcised. He seized Samaritan territory and destroyed the temple of the Samaritans on Mount Gerizim. 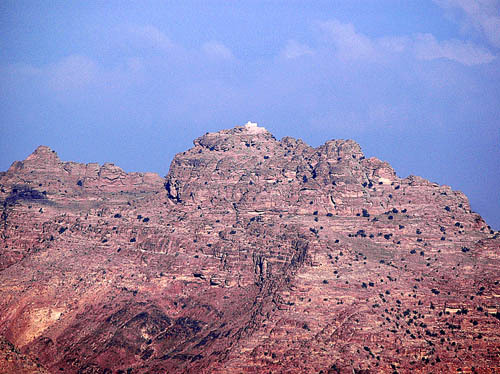 This is the temple alluded to by the woman of Samaria when she said to Jesus, “Our fathers worshiped in this mountain [Gerizim], and you people say that in Jerusalem is the place where men ought to worship” (John 4:20). History is interesting, isn’t it? 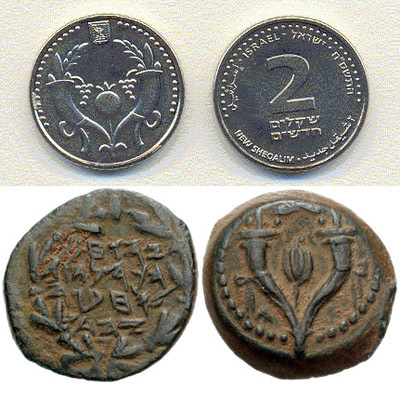 Here is a photo of the new 2-shekel and the bronze Prutah minted in the time of Hyrcanus. The photo is from Wikimedia Commons. Glancing through Hendin and Meshorer, I see that this design was fairly common during the period of the Maccabees. “is a beautiful, symmetrical fruit, scarlet in color. Filled with small seeds surrounded by juicy pulp, the fruit became an obvious symbol of fertility” (King and Stager, Life in Biblical Israel, 104). “The pulp is divided into 9 or 10 partitions which hold the numerous seeds. The pulp is delicious and very refreshing to eat because of its copious juice. the seeds yield a syrup called grenadine. The flowers are used in the treatment of dysentery” (Fauna and Flora of the Bible, 169). Saul stayed on the outskirts of Gibeah “under the pomegranate tree” (1 Samuel 14:2). The girl of the Song of Solomon is told twice that her “temples are like a slice of a pomegranate behind your veil” (Song 4:3; 6:7). She also says, “I would give you spiced wine to drink from the juice of my pomegranates” (Song 8:2). The fruit was used as the design for decoration on the hem of the garment of the high priest (Exodus 28:33). 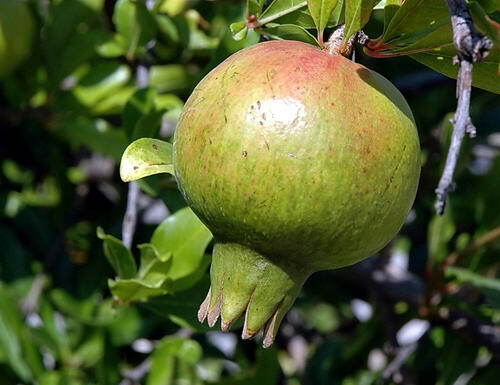 This beautiful pomegranate was growing at the site of ancient Aphrodisias in Turkey. The photo is better than some I have from Israel. Enjoy.